Rod, credited as Rodney Taylor, plays Brody Evans in his first film made in America. Alan Ladd is the star. He plays Steve Rollins, an embittered ex-cop who is released from San Quentin after five years and sets out on a mission of revenge against the men who framed him for manslaughter. 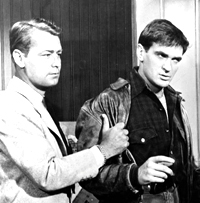 During his quest, Rollins faces off with Rod's Brody Evans, one of the henchmen for Victor Amato, a ruthless San Francisco waterfront gang boss played by Edward G. Robinson. This movie went through a couple of title changes during production. At first it was "The Darkest Hour" because it is based on a novel of that name by William P. McGivern. Then, it was "Hell on the Dock" until Warner Bros. settled on "Hell on Frisco Bay," a decision that signals the film's on-location scenery. Exteriors were shot along Fisherman's Wharf, on San Francisco Bay, at San Quentin Prison, on the Golden Gate Bridge and on streets throughout San Francisco. In addition to McGivern, a screenplay credit goes to Martin Rackin, who was key in getting Rod started in Hollywood, beginning in Australia with "Long John Silver." Rackin wrote the part of Brody Evans with Rod in mind. It's a small role but supposedly something of a milestone. 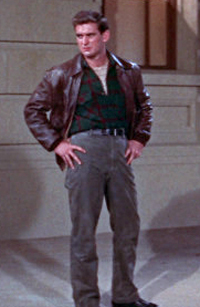 Syndicated columnist Jimmie Fidler wrote at the time: "Rodney Taylor, Australian actor, made his debut on a Hollywood stage in a roar of fistic action. 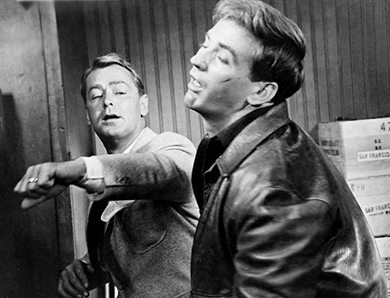 In the first hour of the first day in the picture, he became Alan Ladd's 100th screen knockout victim." 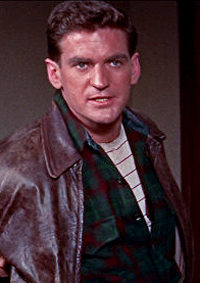 A reviewer of the Blu-ray release noted that Rod "makes every second on-screen count and turns a nothing bit role into a heck of an audition." The film was made for Warner Bros. by Ladd's company, Jaguar Productions. 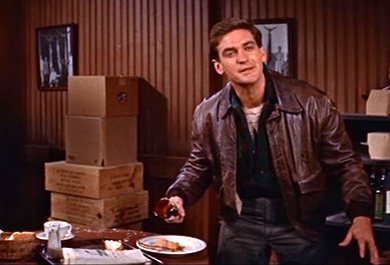 Frank Tuttle was the director, and he also directed Ladd in his star-making appearance in "This Gun for Hire." Joanne Dru plays Ladd's wife, Marcia Rollins, a nightclub singer. (Dru later pairs with Rod in an installment of Goodyear Theatre, "Capital Gains" in 1960). Fay Wray has a small part as she emerged from a decade-long retirement, playing the girlfriend of another henchman played by Paul Stewart. All the fight scenes in "Hell on Frisco Bay" received a lot of hype as the movie was being filmed. Reporters were invited to witness the fight scenes as they were made in the studio and on location. The 1955 release of "Blackboard Jungle" had ramped up the violence shown in films, and movie makers weren't backing down. Television also posed a fresh challenge. "It was tough enough when people just went to the theaters," Alan Ladd told an interviewer in May 1955. "But now with kids also watching fight scenes all day on TV, you really have to come up with something different." 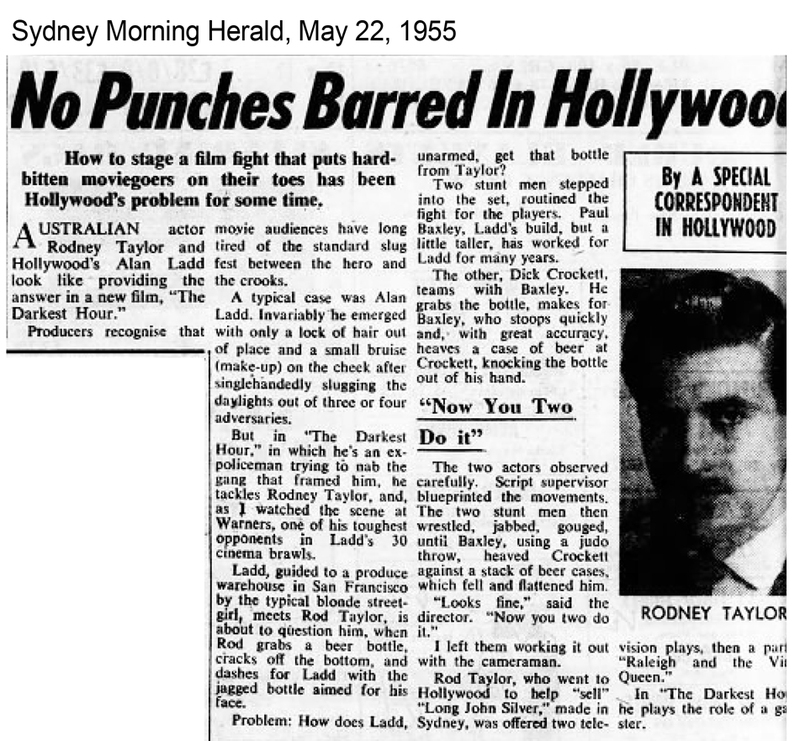 The fight scene between Alan Ladd and Rodney Taylor was praised in a Sydney Morning Herald article, No punches barred in Hollywood (May 22, 1955). The writer opens by lamenting that movie audiences have tired of the standard fight scenes where the hero emerges with only a lock of hair out of place after a slug fest with the crooks. The correspondent witnessed something new on the set at Warner Bros., declaring that Rod Taylor gave the star "one of his toughest opponents in Ladd's 30 cinema brawls." The two actors observed carefully. Script supervisor blueprinted the movements. The two stunt men then wrestled, jabbed, gouged, until Baxley, using a judo throw, heaved Crockett against a stack of beer cases which fell and flattened him. "Looks fine," said the director. "Now you two do it." I left them working it out with the cameraman. The cameraman, by the way, was John F. Seitz, who was the cinematographer of such visually inventive films as "Sunset Boulevard" and "Double Indemnity." Ladd certainly rounded up top talent for this production. 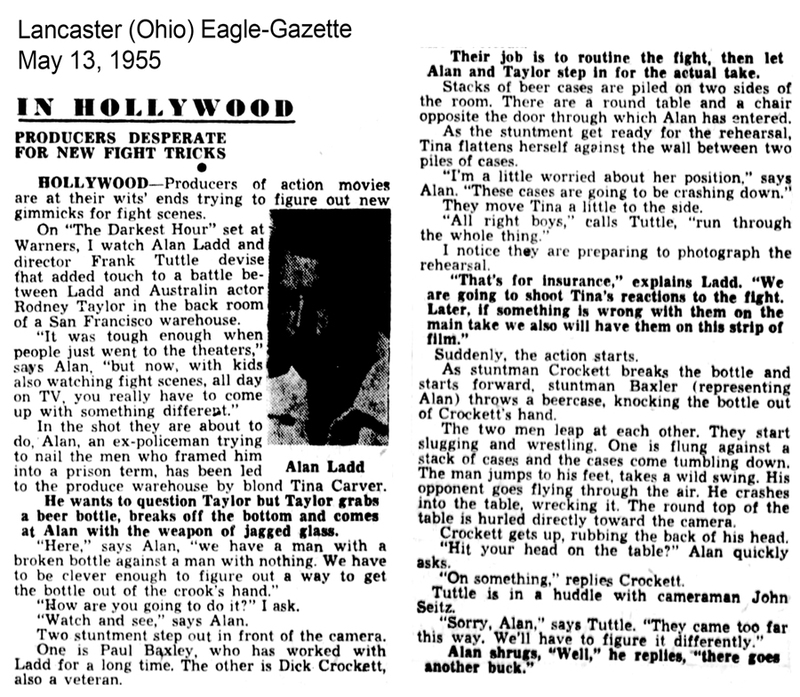 For more about the fight scene, read this syndicated column that ran in the Lancaster (Ohio) Eagle-Gazette in May 13, 1955: Producers desperate for new fight tricks. "Hell on Frisco Bay" represents a case study in the challenges facing the collector of vintage film and TV. The 1955 film never had a home video release until it came out on DVD and Blu-Ray in 2017. Copies that existed were low-resolution versions that had been recorded from TV. The broadcast versions used the pan-and-scan technique to fit the action to the TV screen, thus degrading the original CinemaScope aspect ration. Such a VHS recording is what I owned for many years, and there seemed to be no hope for a better version. The original negative of the print was presumed lost, leading to a big question mark regarding the legal rights to the film and the fate of future releases. The discovery of the negative in Warner's archive changed everything. This is the sort of thing that gives me hope for other missing pieces in the Rod Taylor collection, as well as for movies that have only ever been released on VHS or recorded from long-ago TV broadcasts. Details about the process of clearances and conversions for "Hell on Frisco Bay" are explored at blu-ray.com.